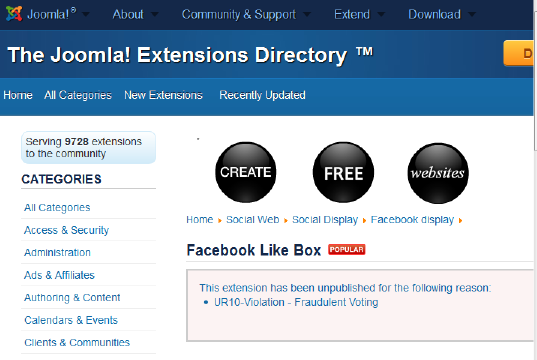 Popularity comes with a price... that maybe true for now for one of VivoCiti.com's Joomla extension (Facebook Like Box) injustified delisted from JED and in turn my account banned with the rest of other free & popular extensions from VivoCiti.com. For readers & members who love Joomla, I need your support. If this fraudulent detection system (I believe it should be very advance) caught the wrong guy (developer) , it is definitely very discouraging and more will be the victim in a future. We dont wish to see this happening. 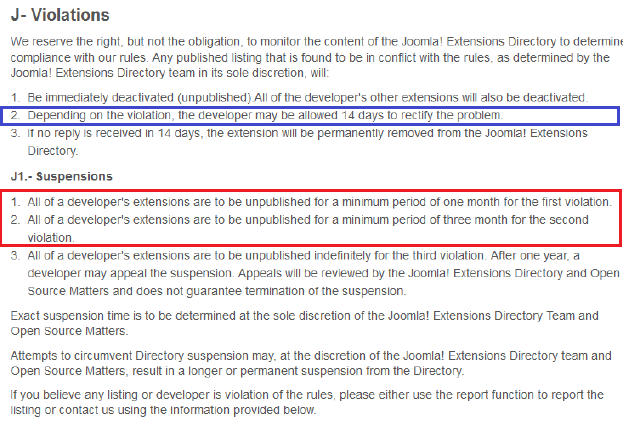 We need more encouraged developers to contribute more free non commercial extensions to Joomla. 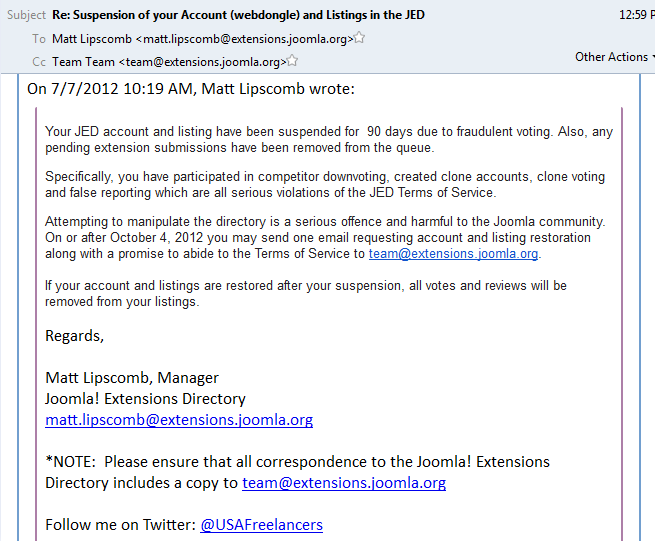 For Matt Lipscomb, JED Manager,I think you dont deserve to sit as one of Joomla Management people with your arrogant. To receive such an email from you is already a very shocking news and now I have been waiting patiently for past 5 days for your response, sending you email 2 times to ask for further tally investigation & I will cooperate....however till now no news at all. To compare my experience with other more prominent open source blogging and CMS platform, Wordpress now I can conclude they have more friendly team to support their developers & willingness to help. Maybe that is why Wordpress will be always the greatest. Dear Matt and JED Team, I have kept asking what does your email subject mean: "Suspension of your Account (webdongle) and Listings in the JED" ? I only can suspect you have suspected my own account (anenwu) and all my extensions because it somehow related to that (webdongle) ? Till today still no answer from you and JED Team. Matt, yes I agree it is a serious offence and harmful to the Joomla community if a developer has really done such an act. But Matt and JED Team: Would it be more serious and harmful to the developer himself if at the end of the story, the developer has not done such act but now it was accused of having done it? Quite different from other open source community, no warning email first to rectify, whether you are justified or not justified to cooperate and rectify the matter (at least until now I have not received any responses about this matter) and just given 3 months suspensions though in JED TOS itself clearly states differently the rules of the game. As a Joomla developer who has falled in love with Joomla started from 2005 as end user...that was still early Joomla 1.0 (my IT background is totally from different world and far from scripting technology such as PHP, spesialize in J2EE which all sort of heavyweight applicaton servers/containers and framework), then started to learn to create Joomla extensions for own used and the triggered point was having a thought about why not I just contribute this piece of useful extension back to whoever need to use at JED and it was just flowing out and kept flowing out....till today. Okay to make it straight to the point, till today here how this website looks like, VivoCiti.com. For members who are following my website from 2005, will know some of early extensions/tools that have hit JED Listing. (i.e. YouCMSAndBlog IDE, Joomla Module Generator, Joomla Plugin Generator which has been sitting as one of the popular tool in JED Listing). Readers or members, just looked back, use whatever the tool on the Internet you can trace back all the release date of those extensions. Yes, all those extensions, plugins and tool was released just since I started to get involved more with Joomla and great passion for this beautiful open source CMS. While it was still puzzled me plus shocked with that unjustified email from Matt after received it and meanwhile waiting for his explanation after I replied by even saying "sorry to have this situation" and asking for more detail and tailor investigation to this matter, this morning I stubmled upon my own extension page which was delisted which is redirected from Google. I suspected this could be the root cause of my account suspension inclusive all my hardwork & free extensions unlisted from JED. Yes, this is our popular Joomla extension which has been ranked as Popular in JED and even ranked top in Google search result. 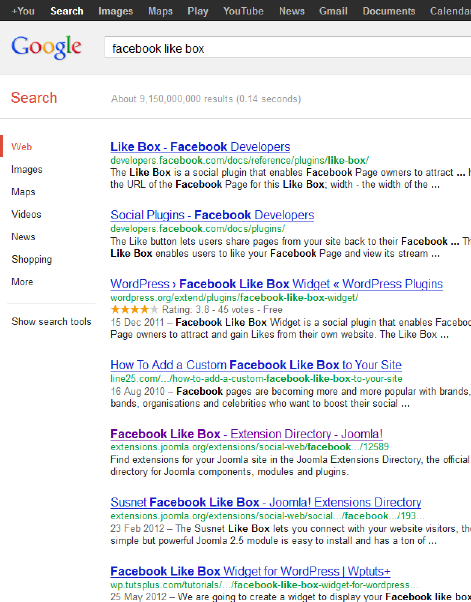 Just googling "Facebook Like Box" and clicked on that link which will redirect you to JED. It was released last year, made a hit again and still making a hit till today in JED Listing, our Faceboook Like Box. Readers or members, if you are one of the person who is sitting on JED Team now and has the right to access and investigation and bothered to assist for this unjustified decision, do your wise and tally checking and hopefully can find a little light at the end of the tunnel. For Matt & JED Team, I am discouraged by this act of JED Team and still the same as email I have sent to request you to do more tally investigation of this matter. Dont jeopardise this beautiful Joomla community by discouraging honest developers, contributing a free extensions (vs those commercial extensions). Give this or other uncommercial extensions developer a space to breathe there, JED Community !